Hi Friends, Aj Is Artical Me Janenge Google+ (Plus) Page Kya Hai Or Kaise Banaye Business Ya Website Ke Liye. Dosto Pahle Hi Me Bata Diya Hu Facebook Page Kaise Banaye Our Twitter Account Kaise Banaye Or Kaise Use Kare Step By Step Or Iske Tarah Linkedin Kya Hai Or Linkedin Par Apna Account Kaise Banaye. Agar Apke A Sab Social Sites Me Account Nhi hai To Aap Yaha Se Bana Lijiye.Toh Sabse Pahle Ham Janlete Hai Google+ Page Kya Hai. Pendrive Ko Bootable Kaise Kare Windows Install Ya Format Ke Liye. Sabse Pahle Aap Browser Ke URL Me– www.plus.google.com Type Karke Search Kare. Agar Apke Google Account Login Ho Giya Hai Toh Yaha Create Page Par Click Kare. Dosto Google+, Facebook, Twitter and Linkedin Jaise Hi Social Networking Sites Hai. Agar Apke Google (Gmail) Account Hai Toh Hi Aap Google+ Page Create Kar Sakte hai Like Jaise Facebook Me Karte Hai. Or November 7, 2011 Ko Google ne Google Plus Page Ko Lunch Kiya. Dosto Agar Apke Business Ya Website Hai Or Apne Abhi Tak Google+ Page Nhi Banaye Hai Toh Aap Bhut Badi Galti Karrahe Hai, Kyu ki Abhi jyada tar log Social Networking Sites ke Sath Jude Rahte hai Dosto Aap Yahase Apke Local Business Ya Website Ko Free Me Promotion Kar Sakte Hai, Or Bhut Sare Karbhi Rahe Hai. Sabse Khas Baat Jiska Website hai Oh Yahase 40 % Apne website Trafic Badha Sakte Hai. Me Suggest Karunga Ke Aap Google+ Page Jarur Use Kare Taki Apke Website Ya Business Ke Pahchan Badhe. Toh Finally Dosto Google Plus Page Banane Ke Liye Apko Google Par Gmail Account Or Google Plus Account Banane Honge, Agar Apke Pass Gmail Or Google Plus Account Hai Toh Niche Ki Step Follow Kare Ya Phir Yaha Se Banale. Google Plus Account Kaise Banaye. Dosto Google Plus Page Create Karna Bhut Aasan Hai Bas Niche Diye Gaye Step Ko Follow Kare. Note: Dosto Aap Is Step Ko Pc/Laptop Me Hi Follow Kare Kyu Ki Sab Mobile Me Ye Page Ko Support Nhi Karta Phir Bhi Ek Bar Mobile Se Try Karle. Create Page Me Jate Hi Apke Samne Choose Your Business Type Ke Page Aajayega. Yaha Apko Business Chunna Hai Ap Jis Type Ke Page Create Karna Chahte Hai, Niche Screenshot Dekhe. Agar Apea Koy Shop (Dukan), Restaurant, Retail Stor Ya Phir Hotel Ke Liye Page Banana Chahte Hai toh Is Ko Chune. 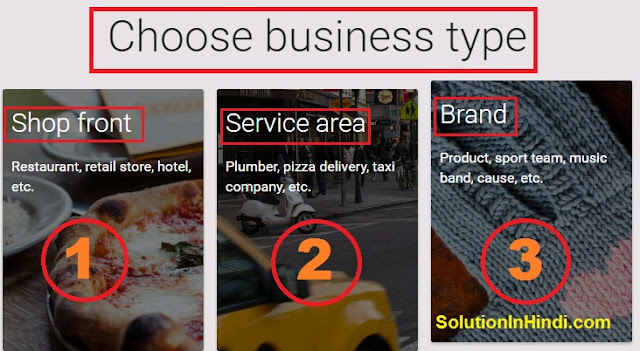 Plumber, Pizza Delivery, Taxi Company, Etc Matlab Service Type Ke Page Banane Chahte Hai Toh Service Area Ko Chune. Agar Ap Entertrainment, Community (Website), Sport Team, Music Brand, Product, Etc Is Type Ke Page Chahte Hai Toh Aap Brand Me Click Kare. Dosto Me Apko Website Ke Liye Page Create Karke Dikhaunga Brand Option Ko Choose Karke. Or Agar Ap Shop Front Ya Service Area Me Page Create Karna Chahte Hai To Unme Se Ki Ek Ko Choose Kare Phir Ako Pura Deteils Bharna Hai, Uske Bad Same Process Hai Phir Bhi Agar Kahi Problems Aye Toh Comment Karke Hame Bataye. Page Name Type Kare Jo Apke Page Me Rakhna Chahte Hai. Yaha Apko Apna Website Dena Hai. Type Of Page Me Click Kar Phir Community, Entertainment, Product or Brand Ya Phir Other. Inme Se Ap Jis Type Ke Page Banane Chahte Hai Usko select Kare. Jaise Mujhe Community Rakhna Hai Isliye Me Community Ko Select Kiya Hu. I Agree Me Tick (✔) Lagaye Or Aap Yahase Pages Terms Padh Sakte Hai. Ab Apko Create Page Me Click Kar dena hai. Aap Agar Chahte Hai Ke Future Pages Releases & Other Relavant Information Apko De Toh Yes Me Tick (✔) Deke Get Started Me Click Karna Hai. Toh Lijiye Dosto Ab Apka Page Create Ho Chuka Hai. Page Toh Bangiya Hai Lekin Aise Chod Toh Nahi Sakte Kyu Ki Age Hame Is Par Kam Karna Hoga Toh Thoda Basic Jankari Bhi hona Chahiye. Or To Or Me Bataya Hu Apko Complete Guide Dunga. Get Started Me Click Karne Ke Bad Is Tarah Show Hoga. New Tab Banake Share an Update Me Click Kare Matlab About Photo Lagane Ke Liye. Google Analytics Ke Get Started Me Click Karenge Toh Jan Payenge Kitna Visitors Apke Website Me Ate Hai. Agar Ap Google Business App Ko Download Larna Chahte Hai Toh Get Android App me Click Karke Download Kar Sakte hai. iPhone Ke Liye App Chahte Hai Toh Yaha Click Kare. Agar Apko Apke Google+ Page Par Photo Laga Na Hai Toh Page Ke Home Me Jake Edit Profile Me Click Kare. About Set Karne Ke Liye Edit Profile Ke Pas About Hai Usme Click Karke About Bhi Set Karle. Me Click Karke Cover Photo Laga Sakte Hai. Yaha Click Karke Profile Photo Laga Sakte Hai. Agar Apko Name Change Karna Hai Toh Yaha Click Kare. Cover Photo Ke Maximum Size 2120 x 1192 Pix. Cover Photo Minimum Size 480 x 270 Pix. Profile Photo Size 250 x 250 Pix. Toh Lijiye Dosto Apka Page Complete Set Ho Giya Hai. 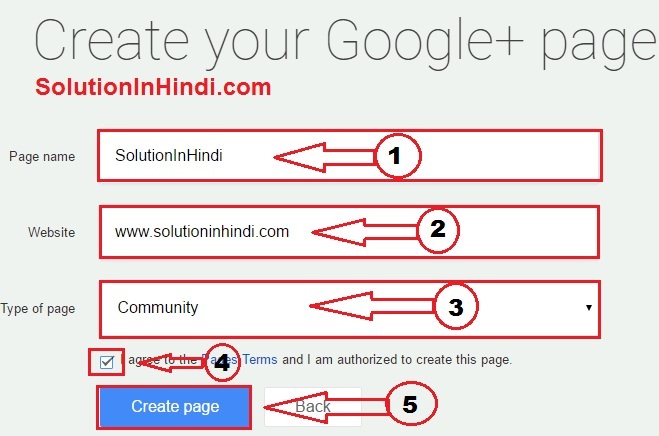 Yeh Website Ko Google Plus Par Follow Karne Ke Liye SolutionInHindi Par Click Kare. Twitter Par Hamare Website Ko Follow Kare. I Hope Ke Apke Liye A Post Helpful Rahega, Agar Kahi Dikkat Aarahi Hai Toh Hame Comment Karke Bata Sakte Hai. Agar Helpful Raha Toh Apne Friends Ke Sath Share Kare Kyu Ki Sab Jan Sake Kaise Google Page Banate Hai. Or Latest Update Ke Liye Solutioninhindi.com Ko Subscribe Kare.Facebook Page Like Kare Or Agar koy Question Hai Toh Facebook Group Join Kare. Prasad Je Website/Blog Ke Liye Page Kaise Banaye Uske Liye Aap Step 2 Me "Create Page" Ka Link Diye Gaye Hai Uspar Click Karke Baki step by step follow kare. Agar phir bhi problem ho to hame jarur bataye.